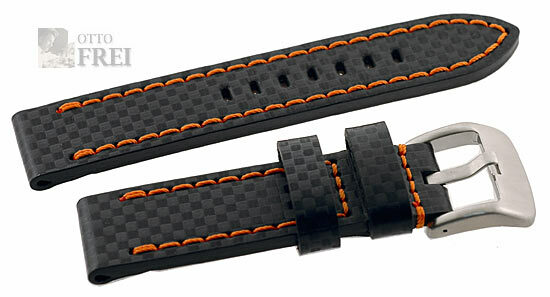 Carbon Fiber style leather sport strap with new rectangular holes and heavy duty brushed stainless steel buckle. 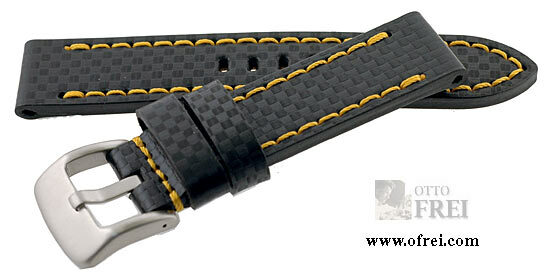 Size: 20 mm lug size by 20 mm buckle. Buckle end measures 3 1/4 inches. Hole end measures 4 7/8 inches. Total length measures 8 1/4 inches. Thickness of the band measures 4.86 mm. Size: 22 mm lug size by 22 mm buckle. Buckle end measures 3 1/4 inches. Hole end measures 4 7/8 inches. Total length measures 8 1/4 inches. Thickness of the band measures 4.86 mm. 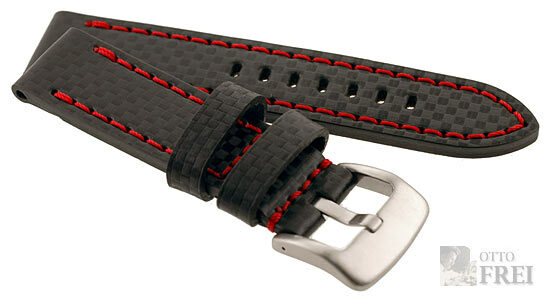 Size: 24 mm lug size by 24 mm buckle. Buckle end measures 3 1/4 inches. Hole end measures 4 7/8 inches. Total length measures 8 1/4 inches. Thickness of the band measures 4.86 mm.